I, personally, believe Lius Vazquez got off way too lightly. While I applaud the forgiving nature of Sikhvir Singh Ji, I believe the judge should have given out a much harsher sentence. Other yaxi drivers have been assaulted in the past, but for many reasons didn't want to or were unable to go to court. I'm afraid this light sentence will insure that others will be assaulted in the future. This thoughtful article is reprinted from AASRA Magazine. Please visit their link and read the whole magazine. It's from my local area and I read it on a regular basis myself. I am including only a few pictures from the article; I hope you will go see the rest of them. Sukhvir Singh’s forgiveness for a man who called him an “Iraqi terrorist” and “responsible for 9/11” led a King County Superior Judge to be lenient and spared him from a longer jail sentence. Judge Monica Benton sentenced Luis Vázquez, 21, of Kent, to nine months in jail and 240 hours of community service for the hate crime. He will be eligible for work-release during his time in jail, the judge said. Sukhvir Singh suffered a brutal, hate-filled attack on the night of November 24, 2007 after police directed a drunken Mr. Vázquez to be driven home in Sukhvir's cab. Mr. Vázquez called Sukhvir an "Iraqi terrorist" and threatened to kill him. As his anger escalated, he attacked Sukhvir from the back seat, putting him in a chokehold, knocking off his turban, biting into his head, and pulling out clumps of his hair. Sukhvir Singh became the innocent victim for Luis Vázquez to vent anger and frustration and hate because of alcohol and having been turned away from Apple Cup at the Husky Stadium. This lead to numerous calls to the 911 center from others using the freeway. Everyone was impressed by the calm of Sukhvir Singh who barely escaped death and brought the taxi to a stop at the busy time of traffic. The attack led to traffic being held up on Interstate 5 highway until the police intervened. Singh, who pulled to the side of the freeway, told police that he had been afraid for his life and that of others on the road. Vázquez pleaded guilty to reckless endangerment, second-degree assault and malicious harassment, the state's name for a hate crime, for the Nov. 24 attack on Sukhvir Singh, an Indian-born member of the Sikh religious community. Vázquez said he did not remember the drunken assault. "I'm really, really sorry for what I put you through," Vázquez told Singh during the hearing that was packed with his family and members of the Sikh community. "I'm sorry for making you have to look back over your shoulder when you walk." His attorney, Greg Girard, called him a responsible man who realizes alcohol played a big role in his actions; he is now in treatment. In court Sukhvir Singh spoke through an interpreter. He said he did not want to see the young man's life ruined. "If someone has made a mistake, they should learn a lesson from it," Singh said. "They should be punished accordingly, and it should be known to society that it is not good to have hate toward any human being." 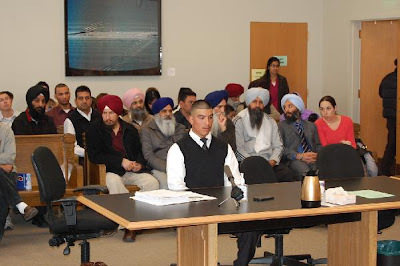 Several members of the Sikh community spoke at the hearing. They talked about how the Sikhs are peaceful and have no ties to terrorists but have endured prejudice and slurs since the Sept. 11, 2001 terrorist attacks. Many members of the Sikh community spoke at the hearing to express the frustration and anguish the community has felt on account of this and other hate filled incidents targeting the young and old in the community. Hardeep Singh, a community attorney helping Sukhvir Singh, expressed how the incident has affected him at a personal level and how he expected the judgment to ensure that hate and prejudice were not accepted in our communities. "The Sikhs in this community have contributed a lot, and it's very hurtful when people attack us based on our looks," said Hardeep Singh Rekhi. There have been "a number of such incidents ... but nothing so egregious" as what Singh endured at the hands of Vázquez , Jasmit Singh Kochhar said. "Hate is one of the most divisive and intolerable emotions that we can have." Gurdev Singh Maan said 9/11 left the Sikh community as hurt as everyone else; he couldn't understand how some could equate Sikhs with terrorists, or even "where they find that word." Benton, the judge, said Vázquez should be given leniency in the same way that Singh has given forgiveness, adding that the attack only reiterated that the community needs to "talk about and address our racial differences. When one drinks, as you did, Mr. Vázquez , those deep-seated fears arise and those prejudices surface," she said. "It is unfortunate, truly, that you do not recall this event, because he will never forget it." Truly the Sikhs who have been victims of hate never forget what they have been through, while forgiving their attackers again and again. They are denied justice in every part of the world. 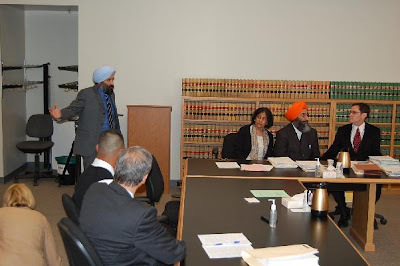 One Sikh man (who wanted to stay anonymous) asked if a Sikh or minority gets in trouble with the law there is no leniency even if it is a speeding ticket, but maybe it is the color of the skin that matters even in a justice system that is meant to be fair? Once his turn signal malfunctioned and he had to pay full fine for “improper lane change.” What the future holds for the community is surely a big question? The acceptance of guilt by Luis Vázquez and forgiveness by Sukhvir Singh has left the community with a “wait and see attitude.” Surely this judgment will go a long way and reflect on the justice system of this country. The statement issued by Sikh Coalition reads: “The journey in front of us is arduous. This was one of the very few cases in the recent past that have been prosecuted as a hate crime. The Sikh community's experiences with hate assaults in Hoboken, New Jersey and Roseburg, Oregon have left the community disheartened. In the Oregon case, a Grand Jury did not charge an attacker with a hate crime after attackers tore off a Sikh's turban and stole it. Even worse, in New Jersey, the Hudson County prosecutor refused to charge a women who grabbed and pulled a turban with a hate assault even though she told the victim that she had a problem with his turban. Nevertheless, the resources invested in order to achieve this result in Seattle were significant. It took a lot of time for dozens of community volunteers who took off time from work, called the press, mobilized other community organizations, pursued all legal options available, organized meetings, and showed patience, poise and perseverance through a somber vigil. Sukhvir Singh speaks through an interpreter. Deputy Prosecutor Mike Hogan is on the right. "If someone has made a mistake, they should learn a lesson from it," Singh said. "They should be punished accordingly, and it should be known to society that it is not good to have hate toward any human being." Luis Vázquez sits with his attorney, Greg Girard, in the courtroom filled with Sikhs and members of Luis Vázquez family. Press reporters from various news media cover the event. 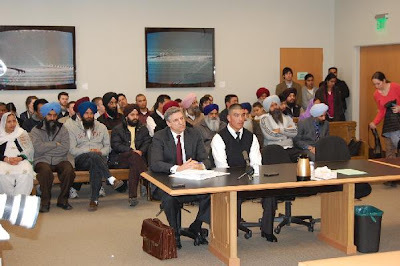 Luis Vázquez in the courtroom filled with Sikhs and members of Luis Vázquez family. Attorney Greg Girard talks with Deputy Prosecutor Mike Hogan, while Hardeep Singh and Sukhvir Singh look on. 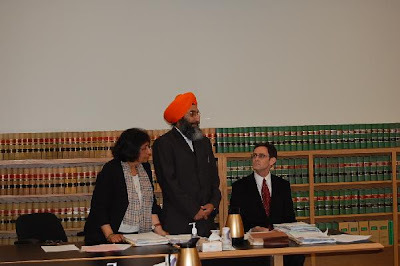 Hardeep Singh (center), with Sukhvir Singh (left) and Deputy Prosecutor Mike Hogan. Editor: Sarab Singh, Kent, Washington, USA. No rights reserved.